Our poly pub chairs with a half round table is perfect for the smaller space. This poly patio set is also the perfect choice for entertaining by the pool or lakefront. Made by the Amish, Made in America! 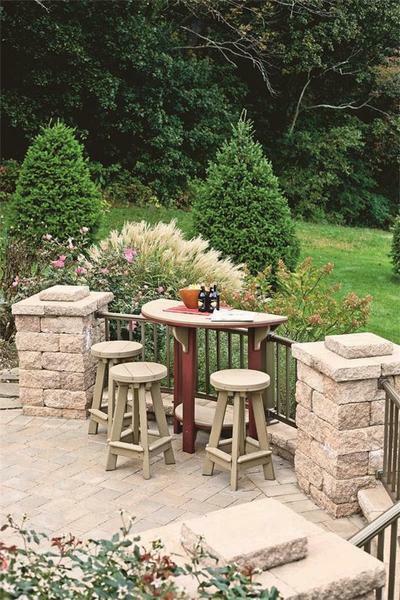 This patio set includes our Poly Half Round Patio Pub Table and two Patio Bar Stools. Made of recycled plastic, the Amish Handcrafted Poly Half Round Pub Table and Bar Stools Set is the eco-friendly, maintenance-free choice in outdoor furniture. Poly is a popular choice for outdoor furniture! Order this patio set online or call toll free 1-866-272-6773. This poly furniture set usually ships within 2-4 weeks of purchase.